This photo was taken in December 2012 in the mid morning. The location was in Washington DC in a sidewalk planter. The "Take It!" Came after having been shown how this could be done by May who is another person who greatly enjoys photography. 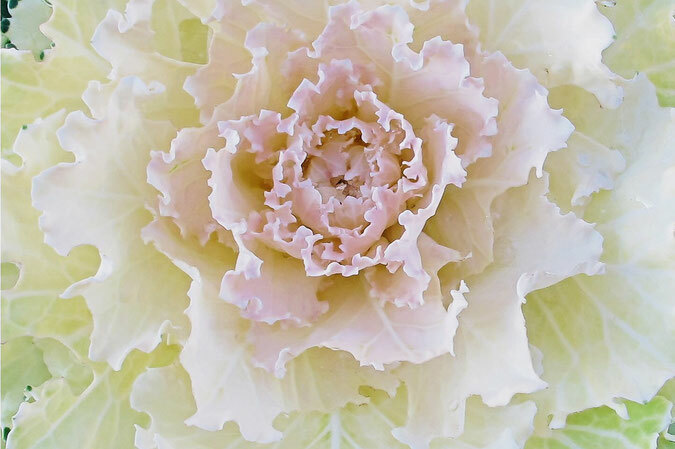 She had taken another photo of this same type of decorative cabbage using a phone camera. I must say the quality of her photo rivaled the picture I took using a regular camera. The After Take: Everyone who looked at this was quite taken with the beauty found in this close up. When they found out that it was taken from a cabbage - they were impressed just that much more. They were just like me - in sharing a view of this plant from a distance as just another way of adding some ornamentation to what would be a bare spot in the winter that would in other seasons be filled with flowers. Each had admiration for May having the eye to make this shot. In the course of my sharing of photos to gather feedback, I sometimes am lucky enough to meet someone else that takes photos too. It is great how quickly they bring out their photos to share them with me. It seems almost everyone has a favorite photo to share. Again, most are on camera phones as they are ever so convenient to use. Here is hoping you take advantage of the camera feature that hopefully is in your phone. The joy of sharing ones meaningful photos is in a special category of its own. Amazing pic. I feel like the perspective is perfect... if it was closer or further away the effect would've been lost. Wow that is intense. Such a clear shot. I really really like this one! New desktop background? Thats cabbage!!!!!? Wow, Def looks different than what I see in the produce department.